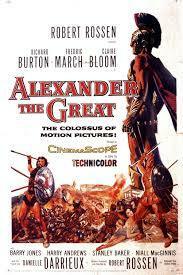 Alexander the Great starring Richard Burton is a terrible film. Its a big bloated Hollywood epic and needs to be killed. Coming in ten minutes from the start when it ran last year on cable I figured I could hunker down and see what all the bad feelings were about. The film has never been held in high regard. Most things I had read called it silly with a bottle blonde Burton looking bored as he tried to carry the film. Having seen the film I would say that I don’t think he tries. Personally I think he just wanders through the film looking bored and wondering when the next check was going to clear. 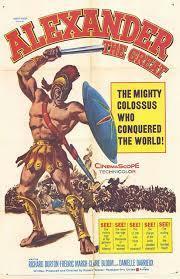 Its an epic film full of inaction and tableaux. Nominally the story of Alexander from birth to death the film is a Cliff Notes version of the story hitting a good number of the highlights. It tries to do too much in it’s 135 minute running time and has no narrative flow it’s just boom on to the next thing, boom into the next thing. People talk more then they act. Its uninvolving and deadly dull. I suppose we could blame part of the problem on the film being trimmed by some estimates by at least a third, the film was planned to run over three hours and have an intermission, but based on what’s here it would have just been an hour more talk. I know many people hate Oliver Stone’s Alexander. Stone himself has an ever changing relationship with the film which has caused him to re-cut the film four different ways (Original, an American version, a Final version and recently another final cut) but at least it was alive. It moved and had characters and tried to tell the story. Even if there were changes to the story, Stone could explain what he did and why. With the 1956 film I have no idea why the choices were made. It feels like a wax museum and not real life.